The Lock Collectors Association offers auctions of locks and keys at our members meetings, when sufficient objects become available for sale. We are therefore pleased to receive details of such items from other members, or the public. The charge for such disposals is at the modest rate of 6% of the sale price (subject to confirmation at the time of booking and the sale arrangements are processed). If you are interested in using this service please Contact Us. This site is to undergo reconstruction and updating; meantime information for Members is to be provided in a new Lock Collector newsletter. Readers will recall that in June last year Tony Beck retired from editing The Lock Collector and Brian Morland has taken over production of the newsletter (now The Lock Collectors Newsletter). To show the type of content available Brian has provided a sample front page and table of contents for the first issue of 2014. This may be downloaded here. We have received word that a sale entitled 'Masters and Makers' will be held on 25th February at Christie's in South Kensington, London including around 50 fine keys. A catalogue is available to order. The lock collectors will be attending the Locksmiths Exhibition at the East Midlands Conference Centre on Saturday 8th March 2014. Those wishing to attend may register online at www.lockexpo.co.uk. Many members will also be attending this years European lock collectors meeting which will be held in the city of Graz in Austrlia on 29th-31st August 2014. Please contact Tony Beck (tony5000@virginmedia.com) for further details or if you wish to attend. The Lock Collector journal is changing! Our secretary, Tony Beck, has decided that after nearly ten years with 38 issues of the journal, the current issue will be his last. Fortunately, another well known UK collector, Brian Morland, has decided to take up the helm. Information on new issues of The Lock Collector, together with information on how to subscribe is available here. We have recently received details of the next European Lock Collectors meeting from Peter Schnurzel, being held on 6th, 7th and 8th September 2013 in Dublin, and organised by Joe Wyse. A programme is available for download here. To help with the organisation, would anyone wishing to attend please let Tony Beck know (tony5000@virginmedia.com) who will pass the details on. The Lock Collectors Association will be attending the Master Locksmiths Expo 2013 on Saturday 14th September. Details are available at www.locksmiths.co.uk/expo-2013/2013-exhibitors. We hope to see collectors there ! Collectors may be interested in the Burglars Beware talk which is taking place as part of The Beating Heart of London's Business conference at the London Metropolitan Archive. A programme for 12th April to 13th April may be found here. Our long time member and Chairman David Key recently received Royal Interest in part of his lock collection! David provided display mounted locks for an exhibition at Keighley civic centre and demonstrated them to Princess Anne. A few photos from the event are provided below. Collectors may be interested to know that Carolyn Sargentson recently gave a talk at the Cooper Hewitt museum looking at the rolw of locksmiths in seventeenth and eighteenth century Paris The talk may be watched on youtube: http://www.youtube.com/watch?v=D9hTnyUs9EA. The Lock Collector journal, issue 33 is now available for members to view on this site. We have just recieved a note to say that a padlock auction will take place in the USA on 30th October 2011. Details may be found on the auctioneers web-site www.daughertyauction.com or by calling US 515 720 2490. We don't have any further information on this at this time. We recently received word from Peter Friedhelm von Knorre that a possible venue for the September 2014 European lock collectors show has been proposed by Joe Wyse: Dublin. This is readily accessible by air (or ferry from the UK) and could provide an excellent location for the meeting and an interesting city to visit. To gather an indication of the level of interest, could anyone who would (provisionally) be interested in attending please advise John Holden by e-mail. This will enable planning to proceed and a programme to be developed (several exciting possibilities are already being explored!). If the event goes ahead UK collectors may wish to consider car sharing via the two ferry routes to Ireland, and John has offered whatever assistance he can give with organising this. A book and article list of suggested reading, compiled by Tony Beck, has been added to the members section. Details of the next European lock show have been added to the upcoming events page. Photos and auction lot listings for the Gordon Harper sale have been added to the upcoming events page. Sasons greetings to all of you! At our next meeting in 2011 (2011.09.02 - 2011.09.04) in Velbert we will be all in the same hotel. Unfortunately this was not possible in Würzburg. In tradition we like to keep the tabels for exebiting collectors free of charge. But with as many attendees it's often only possible if we buy a buffet dinner from the host. Regarding this case we are well set 2011 since we will be invited by the German lockmuseum for their 75. aniversary. The lock exchange will be hold in their premises. There will be guests from the lock industry as well - we are working on the details - you will be surprised. Please book your room soon (today is the best option). The Park hotel is quite nice and spacious. Best wishes, Peter Friedhelm von Knorre"
At the request of Gordon Harpers family the auction mentioned below has been moved to Saturday 14th May, still at the Cresta Court hotel in Altrincham. Viewing of items will commence at 11.00am with the auction itself beginning at 1.00pm. Detailed photographs of the items for sale will follow soon. The Lock Collectors Association are saddended to report that one of our members Gordon Harper has died. His family have asked if a sale may be arranged to dispose of his collection. The venue is tobe the Cresta Court Hotel, Church Street, Altrincham on Saturday 5th February 2011. We expect detailed photographs to be provided in early January; in the meanwhile the following general photos have been provided. Collectors may be interested to know that Brian Morland and Pat Tempest have just published "George Price - Victorian Champion of the Security Trade", a discussion of the life and the locks of George Price. Please see the following web-page for more details, or to order: www.historyoflocks.com/lib023.html. Please note that the collectors meal after the ICL exhibition has now been moved to 6.30pm. Details of the upcoming ICL meeting in Nottingham, together with the 9th European meeting in Germany have been posted on the upcoming events page. The Lock Collectors Association wishes everyone a Happy New Year. Issue 26 of the The Lock Collector is now available online for members to view. Paper copies contain a directory listing of association members which have been ommitted from the online copy. Members who do not receive paper copies can contact Tony Beck (secretary) at enquiries@lockcollectors.eu for details of other members if they desire. Visitors may be interested to know that Paul Prescott has a number of interesting home cutaway Yale 4511 safe deposit locks to sell. Please see here for further details. The Lock Collector journal, issue 23 is now available for members to view on this site. A number of historical articles have been added to the literature section of the members area. Events page updated to include details for the 8th European lock collectors meeting in Parma together with the booking form for members. The current Lock Collector is available and we wish everyone the best for the festive season. The Lock Collectors AGM is now fixed for the weekend of the European lock collectors meeting in London (see upcoming events). It will start at 9.30am after breakfast at the Hotel (Royal National), and is expected to last no longer than one hour. If you have not yet booked your room at the Hotel and are planning to do so, please arrange, and kindly inform John Holden (who has a responsibility for booking reservations) by phone 0161 9280743, or e-mail johnholdensecurity@hotmail.co.uk, or write to John Holden Unit 3 Oakfield Trading Estate, Altrincham, Cheshire, WA15 8EJ. Some time ago J.H. Blakey of Brierfield (Burnley) agreed that our members could visit their premises. This firm is a working business dealing with locks, safes etc. Due to various problems of timing the meeting didn't proceed, however it is proposed to seek a renewel of the invitation at a convenient date. The Lock Collector journal, Issues 19 and 20 are now available for members to view on this site. The Lock Collector journal, issue 18 is now available for members to view on this site, together with a number of new articles in the members section. The Lock Collector journal, issue 17 is now available for members to view on this site. The Lock Collector journal, issue 16 was posted to subscribers on 28th June and is now available for members to view on this site. Printed copies are now priced at – for U.K. Subscribers £9.50; Europe £10; and elsewhere £11. This includes post/packing costs of the four quarterly issues. The Association's AGM was held on Saturday 2nd June at Oldbury in the West Midlands. It was preceded by a day out visiting the Black Country Living Museum and fine weather helped to make this quite enjoyable. It is well worth a visit to see the Exhibition Centre and the working Museum included a trip on the trolley and other buses, plus a journey down an old drift mine for those of an adventurous nature. Members decided to retain the annual membership subscription at £20. The next AGM will be held on Saturday 7th June 2008. Minutes of the meeting were circulated to members. It was agreed that a single page advertising leaflet should be prepared to pass out at suitable times, to provide those interested in lock collecting a note of what the Association does and hopes to extend our activities in the future, to more widely encourage participation. This is almost completed and so will shortly be available. The Lock Collectors Association recently received a message from Dr. Hiren Shah from Ahmedabad in India whom a number of collectors may have met at the European lock collectors meeting in Velbert, 2003. Hiren will be visiting the UK and Ireland between 13th and 31st May this year, and would like suggestions for places to visit or fellow collectors to meet. Please send any messages to enquiries@lockcollectors.eu and we will pass them on. 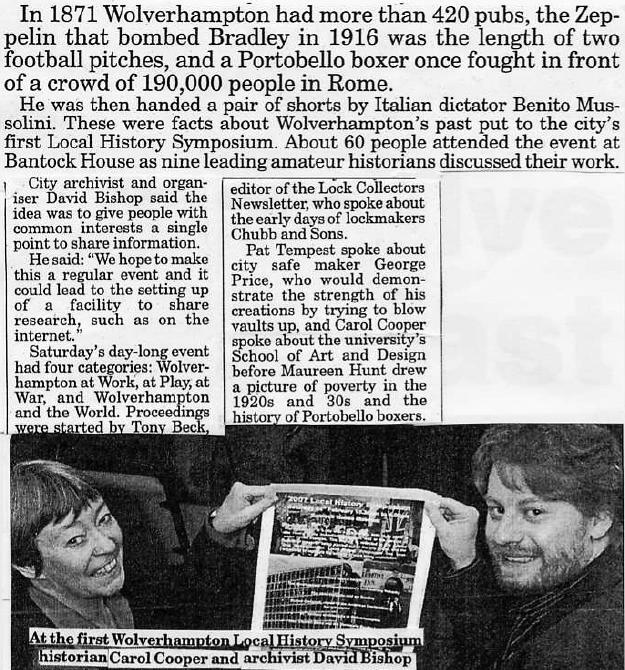 Our secretary, Tony Beck, gave a lecture on 24th February entitled 'A brief history of Chubb' as part of a Wolverhampton history symposium and even made it into the local newspaper! A copy of his presentation is available for download.